Need a crew list with email addresses? Or maybe you just need to see a timecard report for your entire project? GreenSlate offers intuitive built-in system views, but why stop there? Custom views allow you to organize data the way you want, then easily export the data to Excel or a PDF. Combine this flexibility with the time-saving batch actions feature that allows you to approve, reject, view, or delete as many lines as needed in one click, and your tasks will be completed in record time. Can I access my custom views across all my projects? 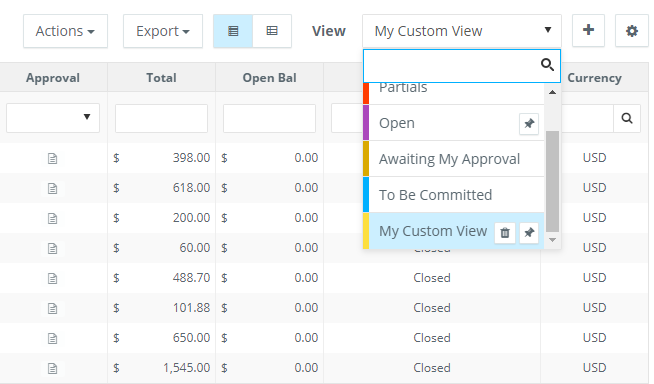 Yes, any custom view that you create will be saved and available in all projects you have access to. How many custom views can I create? Create as many as you’d like! There is no limit and each one is accessible in the ‘View’ dropdown list. How do I add my custom view to the toolbar for easier access? In the ‘View’ dropdown, click the pin icon next to your custom view to add it to the toolbar. Learn more about custom views in our Support Center 'How-To' article.